Welcome to another Tabletop Co-Op article, in which we unplug from the consoles and take a look at cooperative board and card games. Today, we will take on the roles of a group of adventurers, and set off on a trip. Searching the ruins of an ancient city, our heroes must brave the sand and searing heat to find a fabled flying machine. 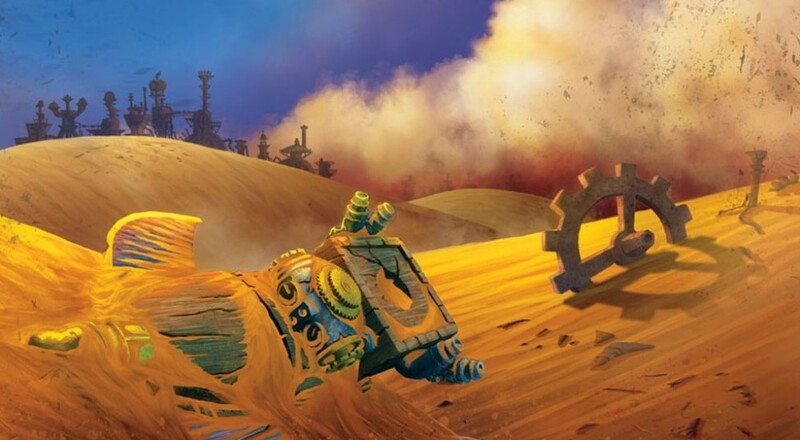 If they find all the parts in time, they can escape the Forbidden Desert! Forbidden Desert was designed by acclaimed co-op guru Matt Leacock. Leacock’s most popular game and biggest claim to fame is Pandemic, which we covered some time ago. Pandemic is the definitive co-op tabletop game, and has led to the increasing popularity of the genre among board gamers. Leacock followed up Pandemic with the less complex but still satisfying Forbidden Island (also the subject of an article here at Co-Optimus). Forbidden Desert is a thematic sequel to Forbidden Island, but features several new mechanics and a satisfying level of crunchy complexity. 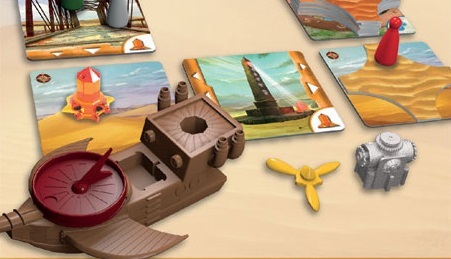 You would think upon first glance that Forbidden Desert is a simple retheme of Forbidden Island. Adventurers wander a strange location, avoid dangerous obstacles, and work together to find the maguffin before time runs out. The similarities are certainly there, and only reinforced by the art style. They both even come in tin boxes! But while Forbidden Island is very much a distilled version of Pandemic, Forbidden Island is something almost entirely different. The game takes place on an arrangement of tiles, representing the areas of the titular Forbidden Desert. Players must draw from a storm deck every turn, and various bad things happen when they do! Most of the time, the sandstorm increases in intensity, and sand tiles are placed on the board. If the sand tiles ever run out, the adventurers are buried forever and lose the game. Other storm cards require players to sip from their limited stores of water as the sun’s rays intensify. The nastiest storm cards are those that make you draw more and more storm cards every turn as the game progresses. The adventurers, then, must balance survival and exploration as they traverse the Forbidden Desert. They can spend actions to move, remove sand from adjacent tiles, or flip tiles over for varying effects. Sometimes you find a well, which gives you water. Perhaps you might find one of three connecting underground tunnels which connect and allow players to move more freely. You might pick up a piece of helpful equipment, or, most likely, find a clue to the location of parts to the ancient flying machine. There are two clues for each flying machine part, one giving the row, and the other, the column of either the motor, propeller, compass, or power source. Once all four of these parts are collected, and the flying machine itself is located, all players must move to it in order to escape the island and win the game. It sounds simple, but trying to accomplish all this while not getting stuck in the sand or dying of thirst can be quite a challenge for even a seasoned group of adventurers. Thankfully, each person on the team is a specialist, and can break the rules in some way. The water carrier can always refill from the well, keeping the scorching sun at bay. The meteorologist draws fewer storm cards each turn, easing the difficulty a bit. The archaeologist is an efficient digger, and the explorer is highly mobile, able to move diagonally. Differing player powers is one of my favorite mechanics in any game, and in Forbidden Desert it really adds to the sense of immersion. As is usually the case with Gamewright releases, the component quality in Forbidden Island is fantastic. The art strikes a nice balance between aesthetics and usability. The tiles are thick and sturdy, and should handle wear very well. The flying machine and its components, in particular, are gorgeous. These pieces are colorful and feel great when assembled. My only complaint about the components is the rather plain pawn pieces. I’d love to see unique miniatures for each different role, but perhaps that would add too much to the cost of the game, which is quite reasonable as it is. The cooperative elements in Forbidden Desert are very strong, and better integrated into the theme than those of Forbidden Island. You can always swap water with any character on the same tile, and can swap equipment as you see fit as well. Several roles are well suited to teamwork, including the aforementioned water carrier and the navigator, who can use actions to move other players. The climber can carry one other player along as they move, also. These little touches, as well as the planning and teamwork needed in order to win, make this a very cooperative game indeed. I really enjoyed Forbidden Desert. I was expecting a simple retheme of Forbidden Island, but the games feel much different on the table. 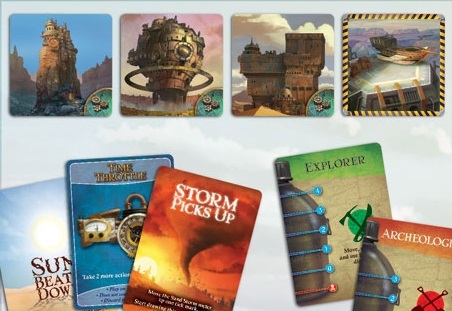 The tension of the storm deck, the puzzle-like challenge of making the best use of player equipment and abilities, and the excellent component quality combine for a terrific cooperative experience. 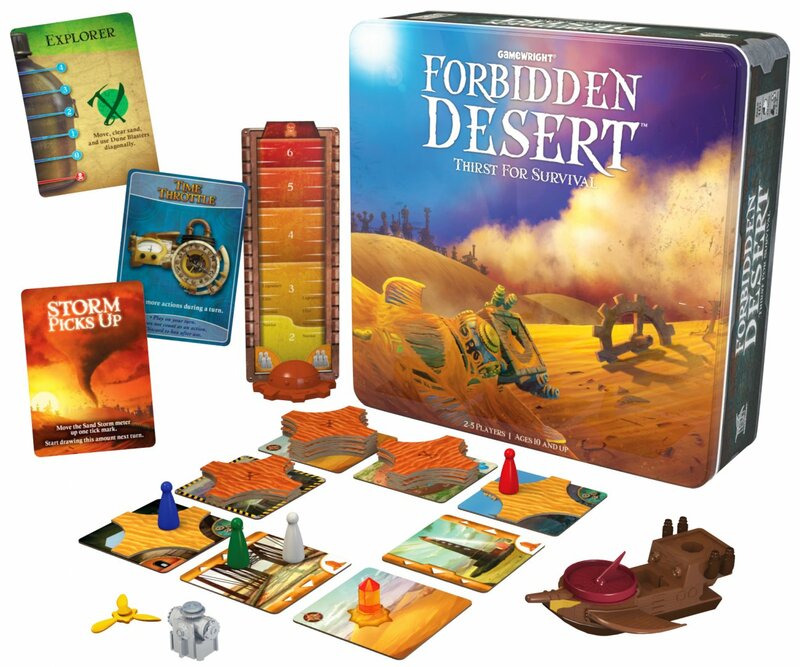 Fans of Pandemic, Forbidden Island, or just good co-op games in general will find Forbidden Desert a joy to play.